You will also need 8-10 wooden ice-lolly or cake pop sticks and 2 baking trays lined with parchment paper. Put the apples in a large bowl, pour over boiling water to cover and then quickly pour it off. This will remove any wax coating from the apples and will help the toffee to stick. Push the sticks halfway into the core of the apples at the stalk end. Microwave the popcorn, according to the pack instructions, and have it ready in a bowl. Next, combine the treacle, sugar, butter and vinegar in a large heavy-based pan and stir constantly over a low heat with a wooden spoon for about 15 minutes until the sugar has dissolved. Bring to the boil without stirring, otherwise the sugar may crystallise, until the mixture reaches 149°-154°C, 300°-310°F or the hard-crack stage. If you don’t have a thermometer you can check that the toffee is ready by dropping a teaspoon of the mixture into a bowl of cold water. It should harden instantly and, when removed, be brittle and easy to break. If you can still squash the toffee, continue to boil it. Remove the pan from the heat and tilting it, quickly and carefully dip the apples one at a time in the toffee, twirling them as you do, to completely cover. Let any excess drip away before quickly scattering with popcorn whilst the toffee is still hot and place on a baking tray to harden. This is easier to do with help, with one person dipping and the other scattering with popcorn. If you find the toffee becomes too thick because the temperature has dropped, just heat it up again. Once set, store the toffee apples in an airtight container in a dry place, not the fridge, and eat within 24 hours or the toffee will soften and start to liquefy. If you have any spare toffee and popcorn after making the toffee apples, just stir them together in a bowl, quickly spoon into clusters on some parchment paper and leave to harden. "Tea Dye Old Clothes : Creative Mondays Blog Hop…"
They look so cool – I've never seen popcorn ones before. 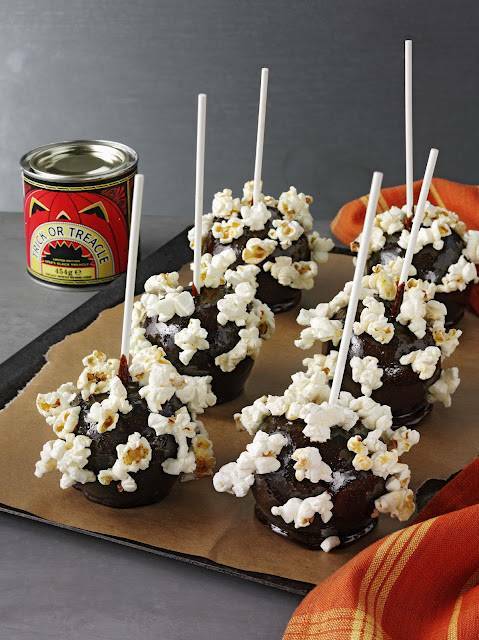 Your popcorn toffee apples look delicious. Great idea for a treat for kids at a party. Thanks for sharing at Snickerdoodle. Pinning.